CINCINNATI -- The Cincinnati Fire Department recommended millions of dollars in improvements Thursday in an effort to prevent future “catastrophic incidents” similar to the death of 30-year veteran firefighter Daryl Gordon. 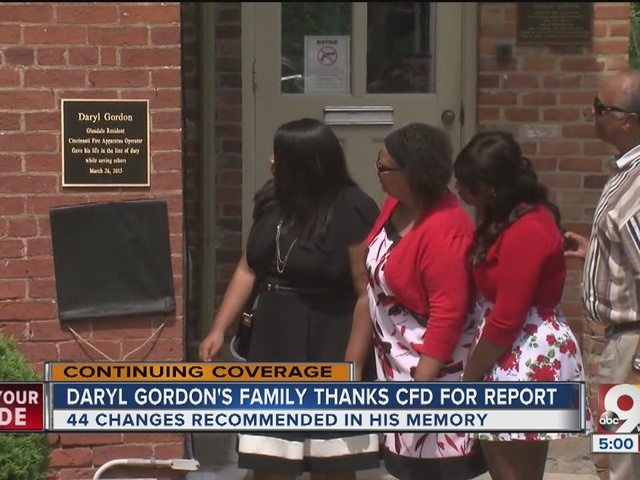 After more than a year, CFD released an extensive report detailing the circumstances that led to the death of CFD FAO Daryl Gordon. The multi-agency investigation found multiple factors at play leading to Gordon's death, several of which federal agencies have identified as commonly involved in line-of-duty deaths. Investigators identified the elevator door -- which had a missing lock mechanism, allowing Gordon and others to open it during the rescue -- as the most detrimental component in Gordon's death. Among the departmental issues uncovered by the investigation, officials pointed to communication problems, operational procedures and training deficiencies as factors in Gordon's death. The report provided a list of recommended changes in departmental staffing, structure and procedures, at an estimated annual cost of $2.3 million. Editor's note: Throughout this story readers will find hyperlinks that connect them to the section of WCPO's own enhanced, digital version of the final report regarding that specific component of the investigation. 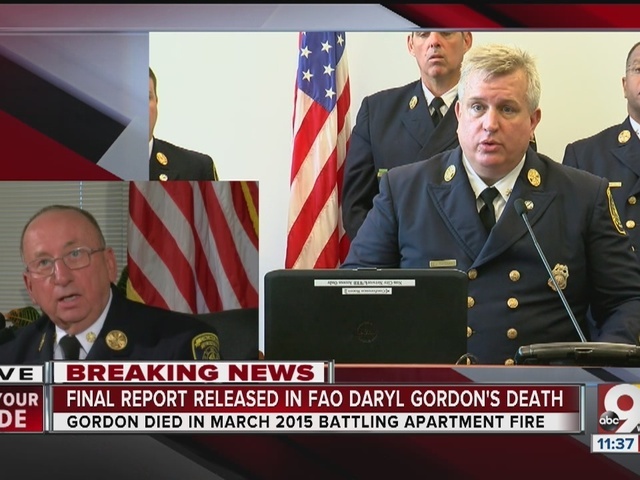 “We must honor the ultimate sacrifice of FAO Daryl Gordon by taking appropriate corrective actions to prevent...more catastrophic incidents,” the fire department stated in its line of duty death report for Gordon. Gordon’s death was ruled accidental, but the report expressed concern over "fireground operational issues" and recommended specific changes within the Cincinnati Fire Department. "This report is us literally beating ourselves up, saying 'What can we do to make sure this never happens again?'" said Matt Alter, President of Cincinnati Firefighters Local 48 union. "The public is very critical, but we're even more critical of ourselves." "Clear objectives, focused strategies and proficient tactics at every incident are essential," the line-of-duty death report said. The report calls for improvements to public education efforts , training , operational procedure and communication . Public education efforts mentioned include cooking safety, smoke detectors, identifying building hazards and increasing fire prevention bureau staffing. Training recommendations mentioned increased training, improving structural firefighting training, creating supervisor and above grade assignment training, updating training facilities and developing training delivery logistics. Operational factors recommendations include the creation of a Division Chief rank, increasing the engine company response complement, managing on scene resources, maintaining crew integrity, revising firefighting procedures and ensuring recognition and communication regarding fireground hazards. CFD Chief Richard Braun said the department is currently understaffed ; the ideal operating staffing is 840-850 employees, but only 812 people currently work in the department. Regarding communication, the report recommended improving radio communication skills and modifying the radio channel template. "Many of the recommendations have already been implemented or are in progress," City Manager Harry Black said. "While we cannot change the tragic events of March 26, I am extremely impressed and grateful for the methodical approach the Cincinnati Fire Department has taken with this exercise." The report also lists 44 "lessons learned" or criticisms of the incident. 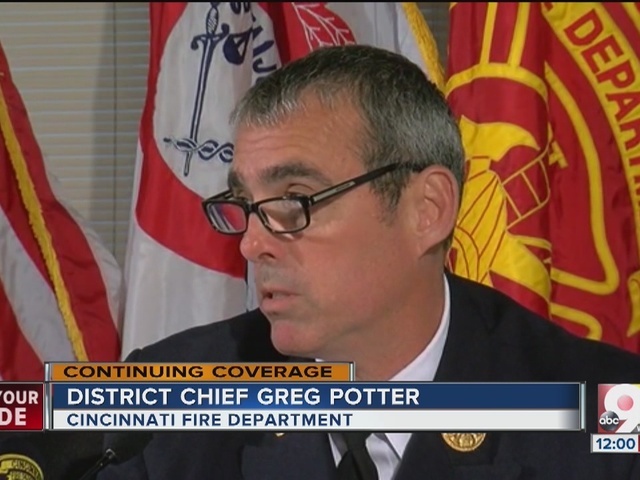 "We took this opportunity to look at ourselves introspectively and exhausted every detail," District Chief Greg Potter said at a news conference Thursday. Potter said the report took more than a year to complete and was compiled by a 26-member team. On March 26, 2015, Gordon was called to an apartment fire at 6020 Dahlgreen St. The fire was accidental, according to the report.
" Fire companies initially expected to find yet another minor 'food-on-stove' incident ," the report states. "Even though smoke was not visible upon arrival, a fire had been growing for a significant period of time. "While not reflective of operations at every incident, first-arriving fire companies did have significant fireground operational issues, including crew integrity, hose deployment, ventilation, search and radio communications," the report continued. Rescue 14, including Gordon, responded when a 2nd Alarm was requested. Rescue 14 responded 30 minutes after the initial 911 call. Gordon was not a permanent member of Rescue 14 company; he was assigned the role for that day only, Braun said. After becoming separated from his crew, Gordon opened an outward-swinging door, with an inoperable interlock mechanism, and fell into the elevator shaft below. The elevator door was considered the most detrimental component in Gordon's death, Potter said. "The 'defective' elevator door was the primary contributing factor at this incident," the report says. "However, a review of recent National Institute of Safety and Health reports found several typical contributing factors that were also present at the 6020 Dahlgren St. incident." The report said Rescue 14 marked the elevator door with a black marker, saying "Do Not Enter Open Shaft." The team members told a district chief about the door, but the information was not broadcast over the radio. Gordon's cause of death was "asphyxiation due to compression of the chest with associated fractures, and contributory causes were blunt impact injuries, left pelvic fractures, scalp lacerations and contusions,” according to the report. Abby Anstead, Tom McKee and Maxim Alter contributed to this report.